WhisperWood Cottage: Word of the Year: Possible! Word of the Year: Possible! 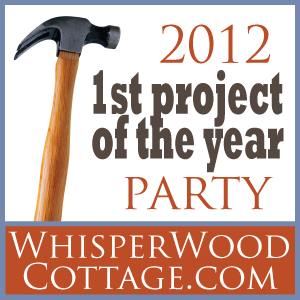 Inspired by Layla's This Little Word of Mine party, 2012 is the year of the possible at WhisperWood Cottage. Time to realize that our goals and dreams are possible. P. 0. S. S. I. B. L. E.
I'm loving the year of the possible! Once you believe "it" is possible, you can take the first step toward making "it" happen. I've been working on answering these questions lately. What goals have I been avoiding simply because I think them as impossible? What barriers have I put up? What thoughts about a situation or circumstance keep me trapped in the past? How would changing my thoughts about my circumstance/situation move me forward? What's my first step in making the possibility my reality? We are each on our own journeys. Each time you take a step forward on your path, you change your story, you make a step toward the possible, you become more you. The current you and the possible you become one and the same. Love that! Whatever it is, it is possible. Start with that thought! Here's to all things possible in 2012! FREE PRINTABLE! : I was so inspired by the one word theme that I put together a printable (below) to get me (and you, if you wish) started. I've never done a printable before but, hey, it's possible to learn it and do it, right? Definitely! It's an 8x10, which you can download or print here. What's your word for 2012? Does the word possible play into you reaching your goals? Remember to link up your projects for a chance to win prizes and feature in Cottages & Bungalows magazine! Party is open January 12-31! Great word!! Mine is Complete!! Complete those things that I started in 2011!! Love this! I'm a new follower!! A great word for the year. All things are possible in Him!! Thanks for this printable! =) Love your site!